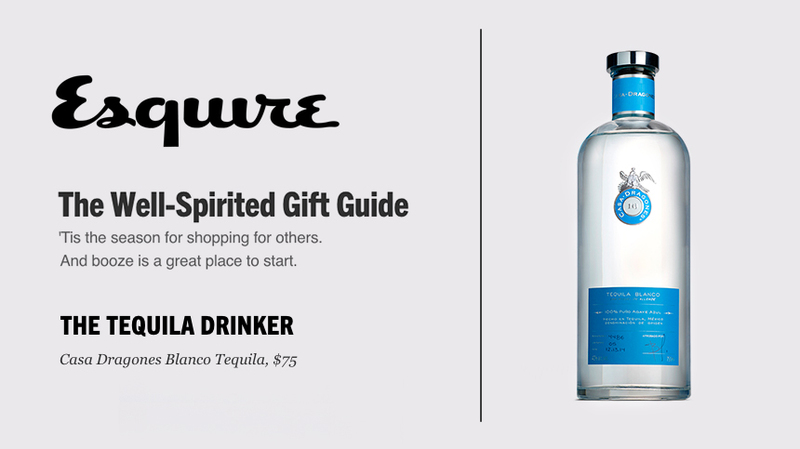 Esquire's "Well-Spirited Gift Guide" lists Tequila Casa Dragones as the perfect gift for the tequila drinker in your life. You can tell a lot about a man by what he drinks. His personality. His style. And what to get him for the holidays. But we're not talking about picking up any old bottle and wrapping a ribbon around it. Too easy. Go one better and add in some great clothes or accessories, so he can stock his liquor cabinet and his wardrobe. Here are some of our favorite style and spirit gift pairings. –Featured in Esquire, 1st December 2015.